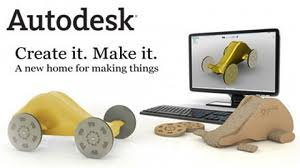 Creating an object with a 3-D printer (see related article on MakerBot), starts with a concept that gets entered into a CAD (Computer Aided Design) program such as Autodesk 123D . This free tool allows you to not only model your idea in software, but also facilitates sharing with the 3-D design community and easy access to fabrication services. Another free tool offered by Trimble (acquired from Google) is called SketchUp. The advanced version, SketchUp Pro, costs $495. The 123D CAD tool is an design entry program to directly enter you idea and create a 3-D model. The model is then exported in “STL” (STereoLithography) format which a 3-D printer can understand and print as a physical object. This is similar to how text characters are represented as ASCII (American Standard Code for Information Interchange) and can be displayed on a computer screen or printed with a standard printer. The interface is user friendly and straight-forward so you won’t have to spend a lot of time learning before you can actually make something. It’s also a direct modeller tool in which you can click on a feature and the tools which are applicable to that feature then become available. No searching through drop-down menus or memorizing keyboard short-cuts! In addition to free-hand entry, you can also specify parameters and geometries similar to other mechanical drawing packages. Within the 123D software suite are three applications – “Catch”, “Make” and “Sculpt”. “Catch” automatically converts an ordinary photograph into a 3-D model. You’ll need to take 20 to 40 still photos of the person or object to get a static 360 degree representation. Upload the photos to the Autodesk site and their computers will compile and render the images into a 3-D model. Best of all, this is available as an App for your iPhone or iPad. You’re ready to print. “Sculpt” lets you edit and modify any 3-D models. This is especially easing using an iPad touch screen or tablet with a stylus. You can start with any of the examples in the included library, or work with your own image. Combined with “Catch”, you can quickly capture and edit real-world objects for your own 3-D printing. “Make” is a an especially amazing utility which allows you create a 3-D object from a variety of different materials, including common card-board. The software determines how to transform the 3-D representation into various 2-D cuts and strips of the designated materials. The component pieces come with assembly instructions for how to create the 3-D object. You can print out the plans at home and cut the materials yourself, or have them done with laser precision at the factory and delivered. Depending on the complexity, the final 3-D object is completed with glue and pins. Like “Catch” and “Sculpt” this is also available as an iPad App. Edit, save and you’re done! The final step in the process is to generate the physical object. For the home hobbyist, there are few reasonably priced 3-D printers (see related article on MakerBot), that you can use to produce smaller items very quickly. If you don’t have a home 3-D printer, there are companies that will build based on your files and ship it to you. For designs that aren’t too complex and about the size of a coffee cup, the price including delivery is about $25. To simplify the process, Autodesk is also working in collaboration with three companies ( Ponko, TechShop , and 3D Systems ) to enable users of 123D to create physical objects from their concepts. With these companies, you can build just one or as many as you’d like. Imagine it. Design it. Print it. That’s all there is to it to bring your creation from thought to reality and you can share with the world.